Grand Master Thich Tinh Tu, whose Dharma Name is Nguyen Nguyen, and pen name Son Cu was born in 1943. He Left Home to become a monk at the age of 14, studying under Patriarch Vien Giac, whose special Dharma Name is Chieu Nhien. His Root Monastery is Giac Hai Monastery in Kanh Hoa province, Nha Trang city, central Viet Nam. In 1968, the Grand Master graduated from undergraduate studies, and graduated from the Central Institute of Buddhist Studies, in Hue City with a Master’s Degree in Buddhist Philosophy in 1971. The Grand Master studied abroad in the United States in 1974. In 1981, he graduated from the University of San Francisco, California, with degrees in Western Philosophy and Clinical Psychology. After two years of spreading the Buddha Dharma in the United States, the Grand Master established Tu Quang Temple, in San Francisco, California, in 1976. Later in 1983, Kim Son Monastery was established on Mt. Madonna, in Watsonville near San Jose, California. In January of 2006, Lien Tri monastery was established in Mt. Vernon, Alabama. In 2010, Thon Yen Meditation Center was established in Gilroy, California. In Febuary of 2012, Quan Am Nam Hai Monastery was founded in Panama City, Florida. The Grand Master is also a spiritual guide for other temples, monasteries, and meditation centers throughout the United States. 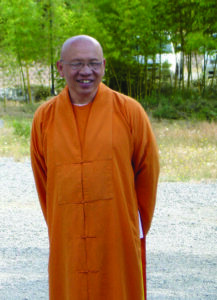 All the monasteries, temples, and meditation centers established by the Grand Master are part of The Vietnamese Sangha Congregation in America. Grand Master Thich Tinh Tu is a Most Venerable Zen Master, well known in the Vietnamese Buddhist tradition, his wisdom and compassion in teaching and in life has earned widespread following and popularity. The Grand Master is skillful in using his intellect, skills in debate, studies in psychology and abilities as an educator in guiding people, young and old, Buddhist or not to the practice of taking refuge in the Three Jewels as a path to living fully and completely; cultivating the virtue in each person, individually. He is also a writer, a poet, playwright, and uses art and music in a skillful way to spread the Buddha Dharma, to educate all beings.